In biology, meiosis (maɪˈəʊsɪs) is a process of reductional division in which the number of chromosomes per cell is halved. In animals, meiosis always results in the formation of gametes, while in other organisms it can give rise to spores. As with mitosis, before meiosis begins, the DNA in the original cell is replicated during S-phase of the cell cycle. Two cell divisions separate the replicated chromosomes into four haploid gametes or spores. During meiosis, the genome of a diploid germ cell, which is composed of long segments of DNA packaged into chromosomes, undergoes DNA replication followed by two rounds of division, resulting in four haploid cells. Each of these cells contain one complete set of chromosomes, or half of the genetic content of the original cell. If meiosis produces gametes, these cells must fuse during fertilization to create a new diploid cell, or zygote before any new growth can occur. Thus, the division mechanism of meiosis is a reciprocal process to the joining of two genomes that occurs at fertilization. Because the chromosomes of each parent undergo genetic recombination during meiosis, each gamete, and thus each zygote, will have a unique genetic blueprint encoded in its DNA. Together, meiosis and fertilization constitute sexuality in the eukaryotes, and generate genetically distinct individuals in populations. Meiosis uses many of the same biochemical mechanisms employed during mitosis to accomplish the redistribution of chromosomes. 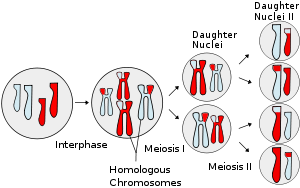 There are several features unique to meiosis, most importantly the pairing and genetic recombination between homologous chromosomes. Meiosis comes from the root -meio, meaning less. ape kte buat mind map atau buat diagram je..
btul tu cgu, buat point lbih paham.